While recently perusing Ulta’s website I came across the Stila Eternal Love liquid lipstick set, which, in the States, is also available at Urban Outfitters and Dillard’s. This set contains 3 shades, 2 of which are brand new, but I believe they will join their permanent liquid lipstick line up in the near future. Since I’m impatient and really wanted one of the shades, I decided to get this little set that would allow me to test them out. Baci, which is the shade I REALLY wanted, is a pale pinky gray shade that reminds me of a shade you might get if you mixed ColourPop Trap and Dose of Colors Stone–review here— together. This is a really light cool toned shade that may not suit everyone and everyone may not like this color, but I love it. I do think it would look best on fair to medium skin tones, but you can easily warm this up with a lip liner or by mixing it with a different liquid lipstick. Personally, I like wearing this on top of MAC Whirl or Soar lip liner. Beso, which is the permanent shade in this set, has been a favorite of mine for a long time. It’s described as a true red that’s not too warm and not too cool. It seriously looks beautiful on everyone, and I’m glad it’s in this set because now I have a mini one for traveling! Ricco is a deep plum shade that is perfect for fall/winter. It’s very grungey in my opinion, and I love that about it. 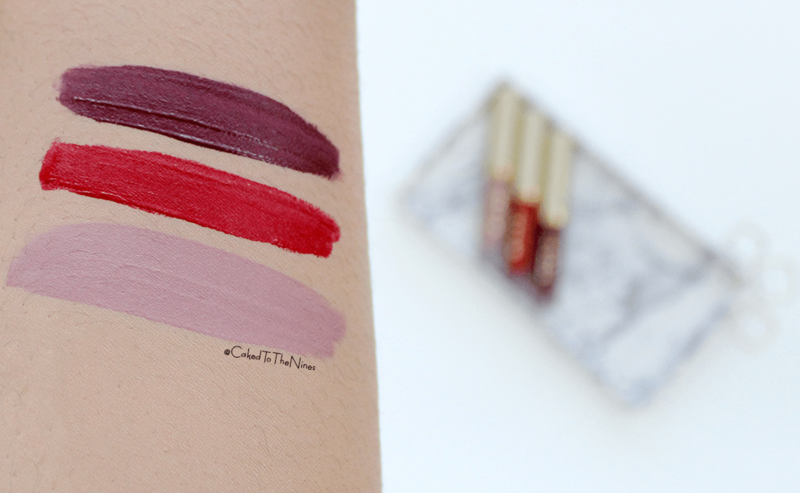 The formula of these liquid lipsticks is consistent with the ones in their permanent line. They’re not super liquidy, but they’re not super creamy and moussey; I think they’re somewhere in between. They’re super pigmented and opaque in one swipe and they start drying down about 40 seconds in, but they don’t fully dry down for a couple minutes so you have time to work with it. They claim to “stay-all-day” but that’s not exactly true. I find them to last anywhere from 6-8 hours, which depends on what you eat and how much you drink, but that’s still a fair amount of time. These liquid lipsticks can feel a bit drying after a few hours, but they are completely matte so that’s expected. The good thing is that they don’t crumble or flake. I have to be honest, I was expecting these to be bigger. For $20 you get .03 oz of product in each tube so combining the three equals .09 oz, which is almost a full sized Stila liquid lipstick and those retail for $24. I do wish these were bigger, but they’re great for someone who wants to try out these shades without committing to one full sized one, and they’re great for someone who has a lot of lipsticks and rarely goes through a full sized one. Are you interested in any of these colors or this set? Let me know in the comments below!